Magazine ad for the game. 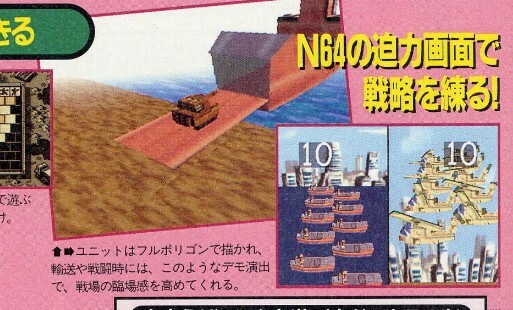 64 Wars, also known as Advance Wars 64, is an entry in the Wars franchise that was intended to be released on January 29th, 1999, being cancelled for unknown reasons. Hudson began developing the game in the late 1990s despite not technically owning the trademark yet. The game was showcased a single time at SpaceWorld 1999. Based on the footage, it would have played similarly to the other games in the series and would have featured land, sea, and air battles (of which were in 3D). Additionally, the game would have utilized the Gameboy Transfer Pack with GameBoy Wars 2 to gain access to several features, such as the ability to transfer match progress between the systems. The menu for this function still appears in GameBoy Wars 2, but can't be used. SpaceWorld 1999 trailer (Japanese VHS rip). YuriofWind's video on the subject. 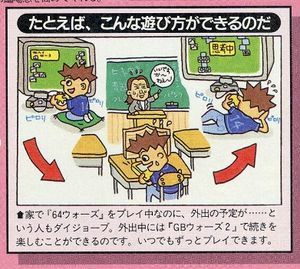 Image describing the transfer feature between 64 Wars and Game Boy Wars 2.